USA Swimming has released the selection criteria for their upcoming major competitions, including the 2019 FINA World Championships set to be held in Gwangju, South Korea next July. The World Championship selection will follow the same format as it did four years ago, as swimmers will vie for spots on both the Pan Pac team and Worlds team this summer. 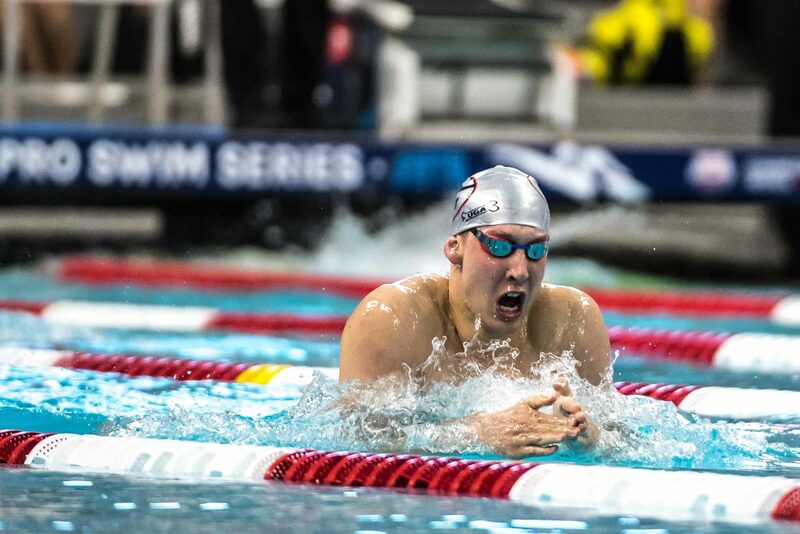 At US Nationals in July, swimmers will compete to qualify for Pan Pacs, and then results from both of those meets will be used in determining the qualifiers for the World Championships the following year. The only real difference for the athletes will be that two men will be able to qualify in the 800 free, and two women in the 1500, after they were added as Olympic events last summer. For the stroke 50s, the winner at Nationals will earn a berth on the World’s team, and the second entry in Gwangju will be offered to the fastest swimmer in the corresponding 100m event using combined results from Nats and Pan Pacs. The maximum roster size per gender is 26. Qualification is predicated on all swimmers achieving the FINA ‘A’ standard times, which won’t be a problem in a country as deep as the US. Relay only members are only required to have hit the ‘B’ standard. It’s also worth noting that prelim times or relay lead-offs from either meet won’t count towards selection. Only ‘A’ final swims from Nationals and both ‘A’ and ‘B’ finals swims from Pan Pacs will be used. You can check out the document outlining the full qualifying procedures here. Anything on 2018 SC Worlds? Nothing appears to have been announced yet. Would really like to see Dressel swim there and most likely break some short course WRs. I’d rather see him go on the World Cup circuit and earn money for doing that. Why not both? So many others are doing both. I’d prefer Worlds though. I doubt he really needs the money, and I reckon training instead of competing in the fall will be what Troy prefers. Why would you doubt he needs the money? I’m sure he had a full ride at Florida but he’s got expenses like anyone else. I’m certain he’ll get sponsors but swimmers don’t bring in a significant amount of money until before, or just after the olympics. Might as well race and earn some money to pay for the rest of the year. Why???????? 2015 World selection was horrible! So many promising people missed out because they peaked a year too late! I’m assuming this is due to the timing of Worlds in 2019? With it being mid-July, you’d have to have the qualifying meet mid-June? Because the focus was on the 2016 Olympics and not 2015 Worlds, which was pretty successful. There’s a lot to be said for giving athletes 3+ weeks of more training the year before the Olympics rather than tapering twice the summer before 2020. I don’t know if it worth it and if it was an intention but such a selection procedure increases the importance of PamPac meet that otherwise can turn out to be pretty boring and ignored by some leading swimmers. By all means, lets repeat the mistake that led to one of team U.S.As worst performances ever at worlds. Of course we have more superstars on the team than last tine so it will probably be more like 2011 but still. Or let’s repeat the success of one of team USA’s best performances ever at the Olympics the following year. To be fair, the 2015 WC’s had a bit of dead weight (older swimmers that hadn’t been dropping PR’s in the last several years). The great thing about USA swimming at the moment is all the young talent in the middle of their rise to greatness. I have confidence in USA swimming to take care of business in 2018 and 2019. Young enough talent to still shine in 2024, and no possibility of USA underperforming in 2028. We’ve waited too long.